Ten year old Tanya, who is HIV positive and unable to walk, is cared for by her father and with the help of her neighbor Florence who she calls ‘Mama’. Her mother died in 2010. Tanya, her brother, and her father, Life, live next door to Florence. 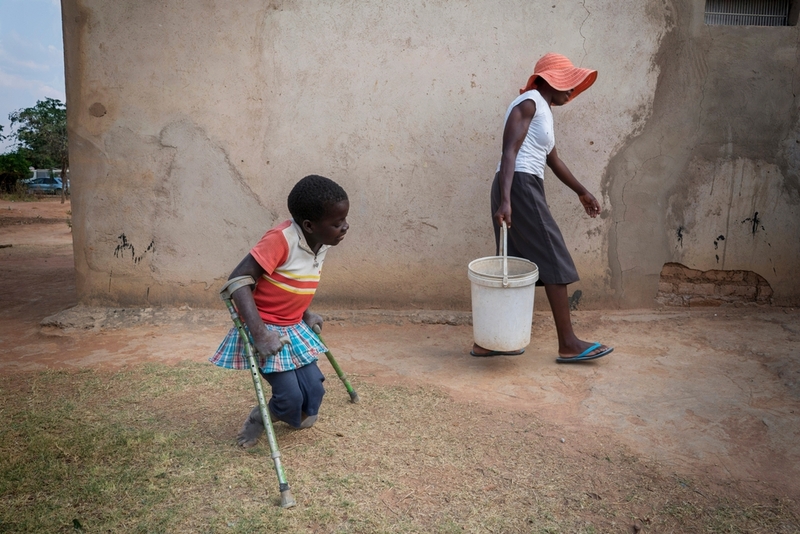 The bubbly young girl, who has never been to school, requires the aid of a wheelchair or crutches to move around. “Before she started her HIV treatment - you would not imagine she would be the young girl she is now. She was underweight, she was not developing properly. Once she started treatment, her health began to improve,” her father says. Curious and social, Life says Tanya is desperate to go to school. Tanya spends most days at home with Florence though, whilst her Father searches for work. With an official unemployment rate of 95 per cent, and no job, Life is unable to pay for Tanya’s education. It’s 8 a.m. and Alice Otiato is walking to Epworth Clinic in Zimbabwe in the bright morning sun, smiling as she greets patients and staff. She stops at the Day Clinic where sick patients are assessed, and quickly scans the room. Her eyes fix on a baby, only a few months old, hanging listlessly over her mother's shoulder. Alice can see this child is seriously ill and asks the nurse on duty where the ambulance is. The nurse responds that they’re awaiting confirmation that the $20 cost will be covered before dispatching the vehicle. Alice is quick to react, reassuring the nurse that MSF will pay the fee on arrival. The nurse promptly calls the hospital and within 10 minutes the ambulance arrives, taking the sick child to the central hospital for urgent treatment. The situation is critical, but this day is not much different than most days for Alice, who is Doctors Without Borders/Médecins Sans Frontières’ (MSF) project coordinator at the Epworth Clinic on Harare’s outskirts. “My typical day at Epworth, it’s a busy day. You never know what’s going to come up. We have a total of more than 11,000 patients, so on average we see 350 to 400 patients. All of them are different; You have children coming in who are HIV positive, you have mothers, fathers, you have adolescents, so it is a mixed bag,” she said motioning to the large gathering of patients sitting in chairs in the outside waiting area in the shade and out of the heat. They’re here to pick up their medication, watch the daily TB or HIV education sessions, or see a doctor or nurse. The Epworth Clinic HIV program began a year later, after it was discovered that rates in Epworth were about 30 percent, which was 6 percent higher than the average national rate of 24 percent. 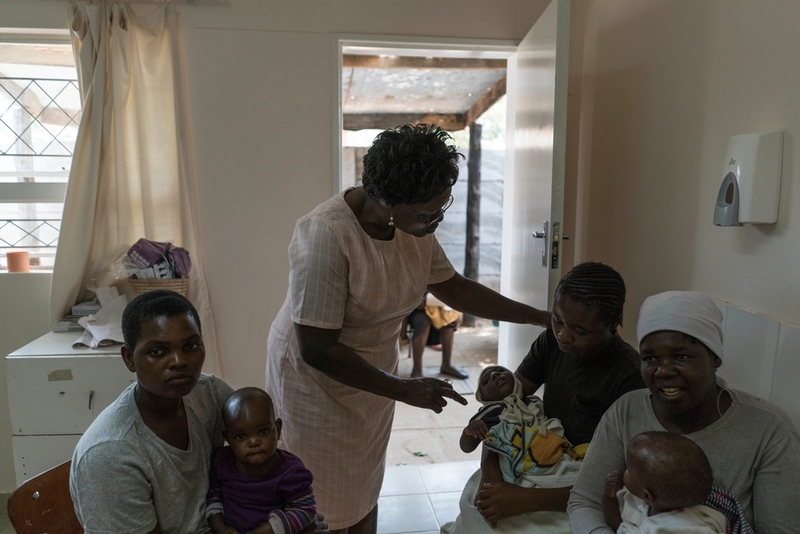 The first patient to arrive at the clinic and register in the program was 40-year-old Florence, a mother of four, who tested positive for HIV shortly after giving birth to her third child. Florence is now one of more than 30,000 patients in Zimbabwe who have received free medical care at Epworth Clinic. “I was always sick, and I decided to go and get tested. I had heard there were MSF staff who were doing free tests at the clinic,” she said. Over the last decade, the program has grown from one stand-alone building to a community medical hub. Beyond just screening and medicating, the program now offers support groups for TB and HIV patients, houses a pharmacy and meeting rooms, and provides counseling sessions. Florence is a testament to its success. Her health has improved and her HIV is under control. She said she’s no longer ashamed of her HIV status. “Being diagnosed HIV positive doesn’t affect me anymore, although, initially, it upset me. Now that I have accepted the situation it hasn’t changed the course of my life,” Florence said as her son runs in and out of the one room house, playing with his neighbors. 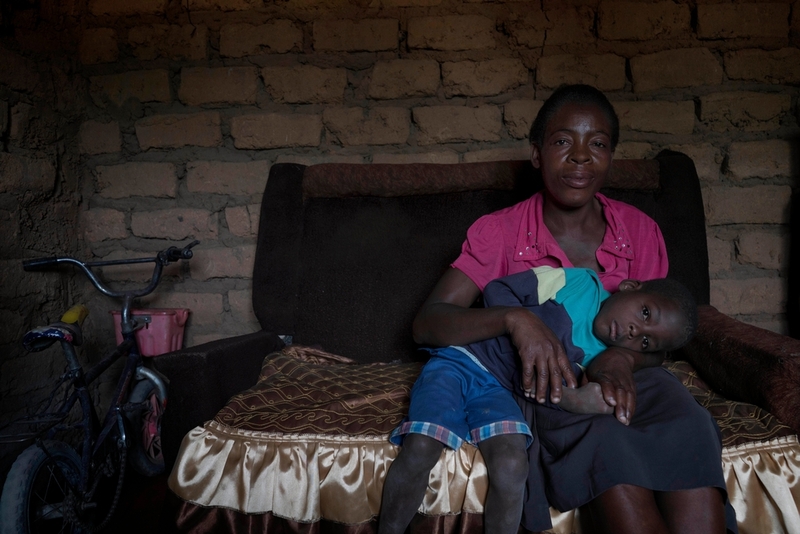 In addition to her four children, Florence also takes care of her late friend’s disabled 10-year-old daughter, Tanya, who was also diagnosed with HIV. Tanya and her mother, who passed away in 2010, were part of the first group of patients from the Epworth HIV program, starting treatment at the clinic on the same day as Florence. “Before she started her HIV treatment you would not imagine she would be the young girl she is now. She was underweight, she was not developing properly. Once she started treatment, her health began to improve,” her father said. Curious and social, Life said Tanya is desperate to go to school. She spends most days at home with Florence though, while her father searches for work. With the unemployment rate estimated to be about 90 percent and no job, Life is unable to pay for Tanya’s education. “When I grow up, I want to be a teacher, because I want to teach people and help them read, even though I don’t know how to read, I want to teach them that they should read. At the moment, I can count to ten and I can write ‘my name is Tanya,’” she said pointing proudly to worn paper on a shelf, scrawled with words and numbers. MSF has worked at Epworth since November 2006, in partnership with the Ministry of Health and Child Care (MoHCC) at Epworth Clinic. Throughout the past ten years, more than 30,000 patients in Zimbabwe have received free medical care at the clinic. Along with providing general health care, the clinic focuses on the treatment of thousands of HIV patients living in and around the community, ensuring they have access to high quality and free medical care. Since the HIV program started a decade ago, HIV prevalence in Zimbabwe has reduced from over 30 percent at its peak in 2000, to 15 percent. Today more than 1,000 HIV-positive patients have formed support groups in the community. MSF trained staff pack bags of medication for TB and HIV patients at the pharmacy at Epworth Clinic, on Harare’s outskirts.